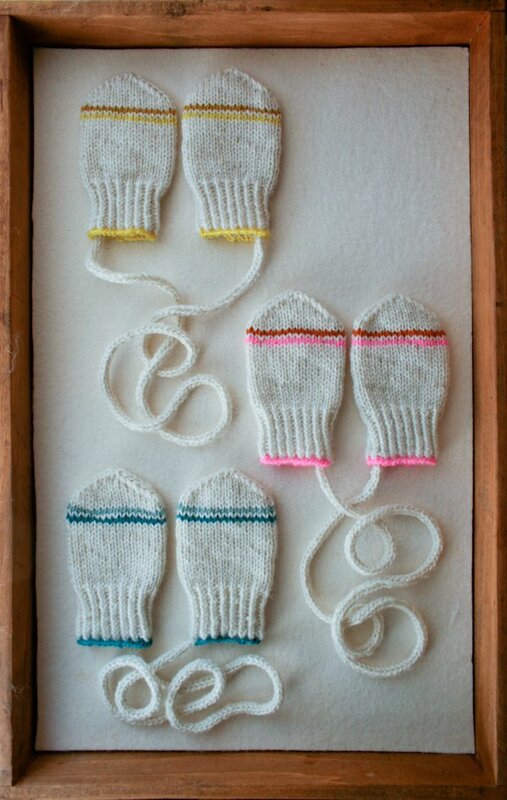 Filing baby mittens knitting pattern ideas. Baby mittens are more advanced projects than baby bibs or headbands. Nonetheless, they are great yarn busters. 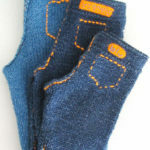 They can be knitted from top down or from cuff down but almost always knitted in the round. So, it is also a good way to learn knitting in the round. I have tried knitting in the round using double-pointed needles and I am not a fan. I prefer the magic loop technique with one long circular needle or using 2 long circular needles. By using 2 long circular needles, I can also knit both mittens at the same time. Knitting 2 mittens at the same time rather than one at a time mean that I will make 2 identical mittens and finish them at the same time. The shape of the mittens is quite straightforward, there isn’t much one can vary. The type of yarn one can use is also limited. So, the only creativity one can exercise is with colour. The collection here reflects that. Purlsoho always offer really good patterns and knitting ideas. These infant mittens are attached together with i-cord so that they don’t lose each other. 2 rows of colours against a background of white make up the basic and understated look. The colour is then repeated at the bind off row. A simple way to create a look. I like. This Marius mitten’s colourwork is inspired by the Norwegian Marius sweater. The sweater was designed by Unn Søiland, a Norwegian knitwear designer and made famous by an actor called Marius Eriksen. Even though I admire fair isle or intarsia projects, I can’t imagine doing one on a big project like a sweater. 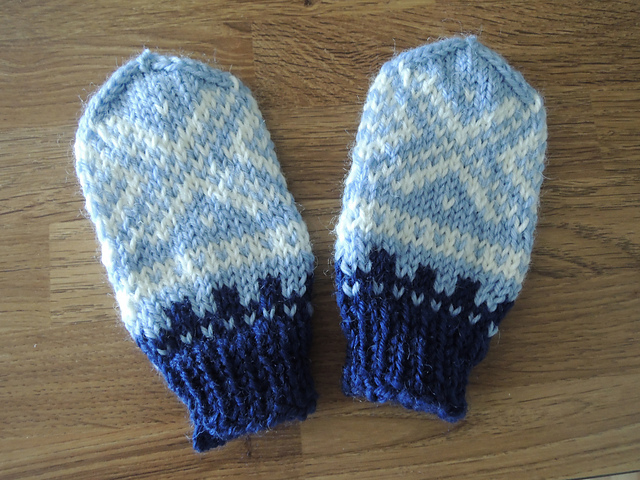 The Marius mitten is an ideal project to try out a Norwegian colourwork on a small scale. Make 3 different mittens with the same 3 colours. This will certainly cut the boredom. 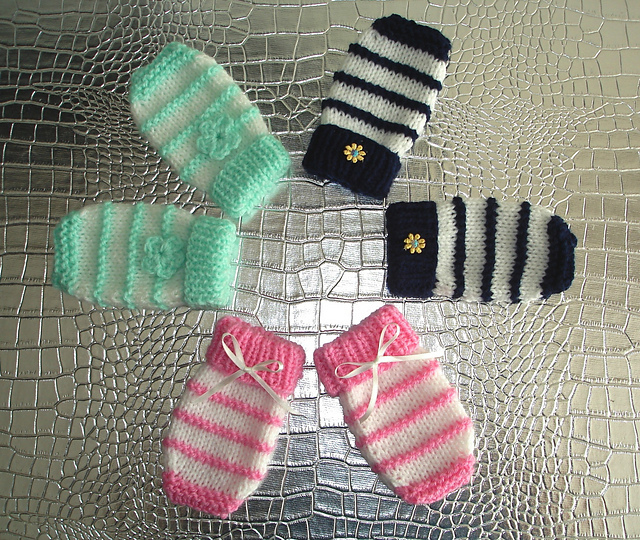 It is fascinating how different the same mittens can look in different colours, blocks of colours and colour stripes. All the patterns before this one all use stockinette stitch with colourwork. This one uses a few purl rows to create a wide garter. Knitting garter stitch flat and in the round is different and this small project is ideal for appreciating and understanding the difference. 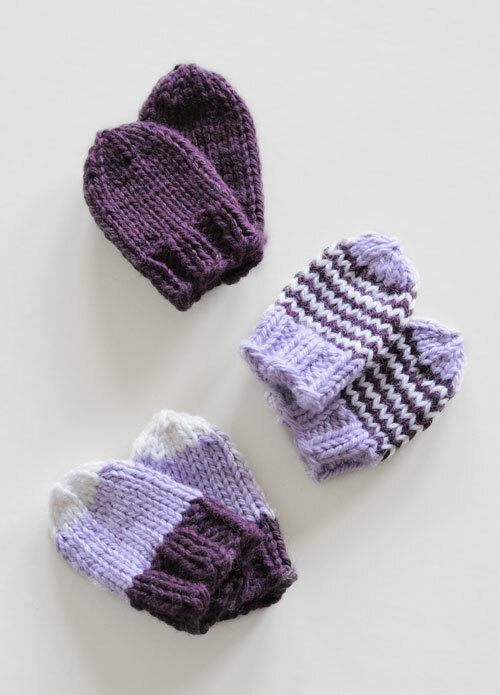 Baby knits are such quick projects with simple straightforward instructions. Here are some baby mittens patterns in audiovisual format. There is no sound for this video. Written instructions are displayed at the top of the video. If you like this list, you might also like my knitted diaper covers list.